Overnight Friday Night: Mostly clear. Lows in the 30s and 40s. Saturday: Mostly sunny. Highs in the 60s. 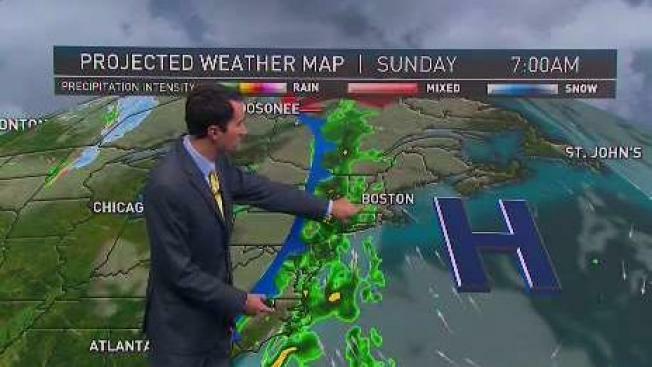 Sunday: Rain spreads in, becomes windy. Highs around 60. A couple of splendid fall days are ahead, with New England reaping the benefits of a high-pressure system producing fair weather up and down the Eastern Seaboard Friday into Saturday. Gusty winds Friday morning subside through the afternoon, but still make high temperatures in the 60s feel like 50s for most of us — and 50s feel like 40s in Northern New England. Clear skies, a light wind and dry air will make for a chilly Friday night as lows drop to the 30s for many and 40s in Southern New England. Saturday’s wind will be a bit lighter, and that will make a noticeable difference in creating a mild feeling as highs ride into the 60s under plentiful sunshine for much of the day followed by increasing clouds during the late day and evening. The next storm system to impact New England produced Friday snow in the Upper Midwest, and though it won’t bring snow to New England, represents a well of cold air and energy aloft, ready to interact with a round of tropical moisture from the south. The result will be a potent storm riding north up the Eastern Seaboard later Sunday into Monday, spreading rain from west to east across New England Sunday morning to late day, respectively, and delivering a round of potentially damaging wind gusts of 50 or 60 miles per hour along the coast overnight Sunday night. Rain will depart Monday morning, winds will weaken below damaging levels but it’ll stay windy Monday as sun emerges and a fall air settles in for the duration of next week, muddied by some showers centered around Thursday in the exclusive Early Warning Weather 10-day.